With the help of our expert workforce, we are designing a wide range of garden canopy tents and outdoor garden canopy. These garden canopy tents are water resistant, manufactured using waterproof fabrics and are customized in terms of size, design and pattern to meet the specific requirement of our customers. With the help of our expert craftsmen and innovative team of designers, we successfully meet the requirements of designer pavilion tents. These are strong in construction and can withstand extreme climate/weather conditions and do not swing away during heavy winds. Our sound manufacturing facilities enable us to offer quality pergola tent to our clients. 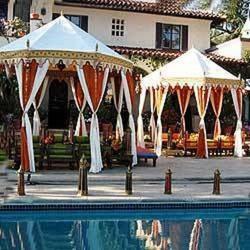 These Garden Pergola Tent are manufactured using qualitative fabric and are available at cost effective prices. These pergola tent have slanted and easily detachable walls. Gazebo tents offered by us are very popular tent for entertainment purposes including hosting of parties. 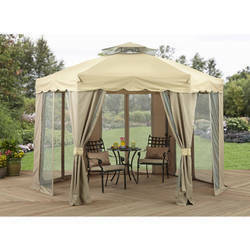 The garden gazebo tent features large space are available in both solid and striped colors. Made from quality cotton canvas/poly cotton, these garden gazebo tent feature waterproof finish and are available in varied color options. 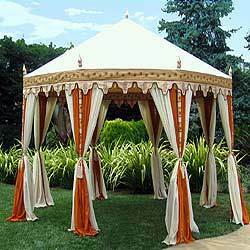 Attractive as well as elegant, the pavilion tents available with us are known for their designs and colors. These tents are available in a wide variety of high quality tent fabrics. The cuts on the edges of the fabrics enhance the look of the tents.